As per Jeff's suggestion, here's an amazingly quick and easy way to make your own cheese. It's most like a Ricotta or Feta, depending on whether you're happy with the finished product as-is, or if you decide to BAM! - kick it up a notch with some briny goodness. Anyway, this type of cheese is so easy to make, you'll wonder why everyone doesn't do it from time to time. Well, I'll tell you, it's not really cheap. You use up about 1 1/3 litres of milk, and you get about 120ml of cheese... No wonder cheese is so expensive! 1 1/3 litres of milk. This is easy to portion out here in Canada if you buy milk by the bag. It works out to one bag. Pour the milk into a saucepan, and heat on high until you get it just boiling. Beware, milk is fussy and will burn in a flash if you aren't watching it carefully. I kept stirring it every minute or two, and keeping an eye on the temperature with a cooking thermometer I bought for my little projects around the homestead. It's not necessary for you to have a thermometer if you can tell when your milk has just started to boil by the bubbles it will form. Turn off the heat, add your vinegar, and stir it up really thoroughly. The milk will start to curdle in just a minute or two. Make sure you stir it up well, then cover, and let it stand for about 15 minutes. Pour the contents of the saucepan into a colander that has been lined with either cheesecloth, or something with a fairly tight weave. I opted to switch to a serviette that we had handy, as I worried that my cheesecloth would be too porous. Squeeze out as much of the whey as possible, leaving behind your curds. I put the cloth "bag of cheese" between two dinner plates, held them up over the sink, and then squeezed as hard as I could. Unwrap your cheese, and enjoy! Just a short rant today, and yes, you can flag it as such. As well, make sure you quote back to me William Strunk if you think I run on. I was struck the other day when a one-time client was complaining about an ongoing problem they had. Once again, in their effort to deal with this issue, they expressed an interest in purchasing a gadget they had seen recently that they felt would solve the problem. I didn't have the fortitude to point out to them (as I actually have in the past), that they had already sunk money and time into other purchases and schemes for getting the outcome they wanted with the materials they had at hand, when if they changed just a few small aspects of their behaviour, the problem would just go away. To my mind, they had lost sight of what they really wanted to accomplish. The solution to their specific concern isn't complicated, and it can't really be solved by purchasing just one more stick of RAM, or one more cooling fan, or one more type of drill, or one more home entertainment component, or one more book, or one more article of clothing. It's funny how people are far more willing to pay money to try to shape their world and their life the way they want it, than to change their actions or their expectations. (n.b. but not ha ha funny...) I think this is a real challenge for humanity as a whole to overcome in the future. We think that if we just switch to environmentally friendly fuels, or sources of energy, or less BPA, or more fibre, or whatever, we can go on living the way we have been, which ISN'T really the status quo, it's actually increasing consumption on every level. We no longer recognize that while our needs are finite and it's perhaps still possible to meet them ethically, our wants are infinite if they are not controlled. As well, fulfilling our wants more and more directly means that we are taking away from someone else's basic needs. What facilitates this is the fact that most of those people aren't in our face any more. They generally live in the third world countries where we extract their resources and their labour, while allowing our pollution to either drift back or even worse, we directly ship it to them! Einstein once suggested that when solving a problem, he would spend fifty-five minutes defining the problem and only five minutes finding the solution. One takeaway from this quote that I get is that good solutions really aren't difficult to find, it's just that so many of them require us to accept that much of the problem lies within us, and we have to take the time to strip away our notions of what we can or should do to get to the heart of what we want to see happen. Personally, I have found myself often solving problems very inefficiently by trying to purchase quick-fixes, or rig up complicated solutions, to problems that only existed in my mind. I have spent days setting up email filters to deal with single pieces of junk mail, with a delete key that I refused to press. Or the big dollars spent on exercise equipment and supplements to help me lose weight, when eating less and attending aikido more works so much better, and has so many positive spin offs. In any case, I guess what I really want to express is how I've discovered that solutions to just about any problem you may encounter are best solved by eliminating things, starting with expectations, followed closely by one's perceived inability to take the steps required to come up with a lasting conclusion to whatever issue is at hand. Pickled sausage, or how to put hair on your chest. Welcome back fearless readers. I hope you don't mind so many recipes on here, but food, food preparation, and food preservation are all vitally important things to know about on a homestead, and should probably be more understood and appreciated by everyone in general. It's really amazing when you get into a grocery store and realize just how much product there is in a preserved state, rather than fresh. I'm not criticizing, just noticing how much our diet is affected by the ability to make foods that can remain on a shelf in a safe state. Anyway, enough of the sermon. Let's get on with today's little project - pickled sausage! Full disclosure - I've never made it before, and if you do much research online, you'll soon discover that there is a multitude of recipes and reviews, but these are all for basic refrigerated pickled sausage. Well, that's fine for people who are just dipping their toes in the water when it comes to self-sufficiency, but we're here to learn the nuts and bolts of living well, but being prepared to do so without depending on so many modern conveniences. What we're going to make today is pickled sausage, canned. I started out with a pound of smoked Oktoberfest sausage, purchased and produced locally in St. Jacobs. That worked out to four, 1/4lb sausages. That's about the amount I can eat in a single sitting by myself! Cut them up into segments of about 1" length, perfect for skewering with a fork (or toothpick for you hoity toity types). I wanted to use jam jars for this batch, as they are easier to get to the bottom of. I always get annoyed trying to fish the last pickle or egg or whatever out of the bottom of a litre/quart jar. You have to hold onto your fork with your fingertips, and get your fingers wet or messy. A 250mL jam jar has no neck, and is plenty shallow enough to be able to easily reach in with a fork and still be in full control. I was able to cram in about 5 segments into each of six jars in this manner, which was fine for me. Next, I mixed vinegar and water in a 1:1 or 50/50 ratio. This seems to be the widely accepted safe amount nowadays. If I had any hot peppers, I probably would have added one to each jar, but, as it was, they are still all out in the garden heating up for later projects. I'll just savour the taste of the vinegar soaked sausage when the time comes. It took me 3 cups of the mix to just about perfectly top off the jars, which was a bit of a surprise. That means that logically, the sausage took up almost no volume in the jars. I guess I will just have to let my mind wrap around that. Technically a cup is only 236mL, and the jars are rated for 250mL, and I assume that that measurement still allows for a generous head space, so that's how I'm going to reconcile this cosmic mystery. I had poured a small amount of boiling water into a bowl with the lids, to soften up their seals, and then placed the lids on each jar, screwed down the bands to just finger tight, and then placed them into the pressure cooker on a small rack. I added two more litres of boiling water to the cooker, as well as a splash of vinegar (to help prevent the inside of the cooker from getting too many mineral deposits), and snapped on the lid. With the burner at max, it took about ten to fifteen minutes for the steam to start to come out of the release nozzle. Once I saw a steady stream of steam, I set the timer for an additional ten minutes. After which time, I put on the weight. The pressure indicator dohickey popped up immediately, but I had to wait ANOTHER ten minutes before the weight started to rock. You can hear the change immediately and easily. I was actually downstairs on the computer when I heard the difference, so I rushed upstairs, turned the heat down to between medium and medium-high (I've canned other things before, so I know that this temperature is the lowest that can keep the pressure up), and set the timer for 75 minutes - the minimum time to treat food containing meat in quantities of 500mL or less. After the 75 minutes, I turned off the burner, and went back to my movie to allow the pressure cooker to cool off on its own. It took about a half hour, but then when I lifted the weight (using a chopstick), no steam escaped, so I removed the weight altogether, and carefully undid the lid. Using a jar lifter, I lifted out my nearly finished product and placed it on another nearby rack to cool. Few things are as delightful as the "click" or "ping" of your lids being sucked down tightly onto the jars. After waiting overnight, I removed the bands so that I could wash and dry both them, and the jars. It's optional to replace the bands. Many people don't, but I find it to be a handy place to store them, and figure that it helps to protect the seal as well. So when I'm sure they are clean and dry, I finger tighten them back on. Not too hard! Just until they touch the lid again - you don't want to accidentally break the seal and be forced to eat the contents right away ;). It's up to you how long you'd like to wait before breaking into your own stock - they'll keep for years in a cool, dark, dry place, but they probably peak in flavour after just a few weeks of soaking. I like pizza, I like it. I also like to do things for myself, so for the past year or so, I've been making pizza from as basic ingredients as I can get to lately, and thought I'd share just how rewarding and fun it is. It's really not that difficult, and the results are light years beyond a crappy frozen pizza, and twice as good as anything you'd buy! First, it's done in two stages. Stage one is to make the dough. This only takes ten minutes, but then you'll want to let it rise at least once, which can take a few hours (last night it only took two, but it was 30 degrees inside!) The next stage is just slapping on the toppings and throwing it into the oven, this takes another ten to fifteen minutes. After that, you're golden! So let's get started. Add the yeast to the water and stir it up well. Let that percolate for awhile, and mix the remaining ingredients together with a large spoon. After a few minutes of the yeast and water resting together, pour them in with the others, and mix it good. I end up switching from the spoon to my bare hands after a minute or so, as the dough gets sticky and stringy. I scrape off the spoon and the sides of the bowl and keep kneading everything into the dough until it becomes a nice ball. covered bowl to rise. As you can see, I use a 2 litre measuring cup and saucer for this step. I oil the interior and saucer, and then step back for a few hours. I usually make the dough around lunch, and let it rise during the afternoon. Don't worry if it doesn't rise as much, it'll still taste fine. This actually makes enough dough for two, 12" pizzas. Knead this stuff back to the original size, and then oil up your pizza pan. I have been alternating between a real pizza pan, and our cast-iron frying pan. Both give really great results! Cast iron makes for an amazing deep-dish experience, while the pizza pan gives you a more authentic thin-crust type pizza. It's also worth mentioning that you can freeze and refrigerate the dough easily. I usually freeze half for the next pizza, unless we're having guests ;). Today I'll be showing off the pizza pan version. Here's the blank canvas, ready for the artist to pour out their soul. When I have friends over, I often go pretty traditional, with tomato sauce and pepperoni and mushrooms (and of course, cheese). But this pizza is for my wife and I, and she allows me to get creative. That's when I generally go for cream-based sauces and a bit more exotic toppings. While she isn't vegetarian at all, she doesn't require meat, and I wanted to also dedicate this particular pizza to my friend Jeff in China, so I decided to split the two sides, a mushroom and feta side for her, and a pepperoni and olive side for me. Here is what it looks like before it heads into the oven. I have been popping mine in at 450 degrees for 22 minutes. If your oven can get hotter, by all means, set it as hot as it can get, and bake your pizza for a bit less time. Hot is the key word for making good pizza. With a bit of luck, and some fancy work with your pizza cutting wheel (or knife, as the case may be), you might be able to cut yours just as I did. It didn't fit on our plates very well at first, but then we started munching on the "tail" as an appetizer, and were soon enough in pizza heaven. Let me know if you give it a try. Oh yeah, I should give a shout out to my brother Chris' girlfriend Natalie, who originally inspired me to try making these pizzas by sending me an equally awesome recipe for a spinach and feta pizza... Mmmmm, I'll be making that again maybe this coming weekend! Well, after an exciting run last Friday, with this blog recording an outstanding spike in views thanks to the cider entry, things have gotten back to normal I think. Thanks to everyone who commented and voted up the story on Reddit - I believe I actually hit number 12 on the "what's hot" list. Digg, on the other hand, never gave me any love... Not that I'm trying to say anything one way or the other. Anyway, that rush to popularity certainly went to my head, and I'm sorry to say it even managed to disrupt a bit of my inner script. I rushed to improve the look and feel of the blog, and then my www.garstin.ca website, and finally the www.aikihomestead.ca domain, which, as I mentioned in my last post, I spent the better part of the day Saturday changing from just being forwarded to this blog, to being a wiki in its own right. Funny how easy it is for life to throw you off your game plan so quickly, isn't it? I started to realize last night that I was getting all stressed thinking about how much work I'd have to do to maintain that level of popularity, and how little knowledge I really had of the things I was working with. Long story short, I think I really lost sight of my ambition to do things simply... I'll leave up the wiki, and continue to use it as a gather place for ideas for the homestead, and I'll certainly try to keep up the blog, letting people know what I'm up to, and what sorts of things Kenny and I do to fill our days. But I won't concentrate so much time and effort towards being all things to all people. To mine own self I must be true :). Please though, please continue commenting and maybe even submitting the occasional posts to various sites where you think it might be of interest, I'd really appreciate the exposure and range of opinions! Check it out if you get a chance, www.aikihomestead.ca, and better yet - edit something or add something! For those of you who are interested, I used the pmwiki platform, with the monobook skin, and then I went into the .css file to change around the colour scheme so that it matched the blog more closely, and THEN I went to www.garstin.ca and did the same sort of thing... I'm way too retentive! Actually, maybe not that bad. There are a few inconsistencies throughout the process, that I think I'm going to live with. I just don't have the time to track down every little snippet of code to ensure that titles and links and viewed links all have the exact same colour scheme. Anyway, just wanted to drum up some interest in the wiki. I'll cross-post some of my blog entries that seem to me to be of value as reference materials. Over the years I've dabbled in a few different financial vehicles and scenarios, and have come to a few conclusions that I'd like to share. Please be sure to realize that these are SPECIFIC to me. These rules make me happy, but they are not guaranteed to make anyone else happy (or wealthy, depending on your ambition). 1) Whenever possible, consolidate and eliminate financial vehicles. Do not have multiple bank accounts at multiple banks. Bank with one bank, and if you're unhappy with them, switch to another and close your accounts with the old one. It's okay to separate business and personal accounts, and it makes sense to do so. Don't use "sub accounts" with silly labels like "vacation" or "new car"... Have a chequing account, and a savings account. If a mutual fund is worth buying into, then it's worth committing to. Don't hold different funds in different families or of different intents. Don't have a mix of "growth" and "income" investments - Your life is either about "growth" or "income" - but how can you justify both at the same time? Even on a sliding scale? If you're worried, then only invest in guarantees. Don't have multiple credit cards. Find the one that's best for you, and stick to it. Multiple balances are a recipe for allowing yourself to get out of hand, and to misplace more bills. 2) There is no such thing as "good" debt, only necessary debt. Very few people have the ability or discipline to pay cash for a house, so a mortgage is a necessity for most. School debt is probably the next least evil. After that, you shouldn't be buying things for yourself using other people's money. I can't think of anything that you can put on a credit card, that you shouldn't be able to pay cash for. This isn't to say no credit cards, I think they're pretty handy and now with all of them offering cash back or points, you really need to play their game. I'm just saying never, ever carry a balance unless you're having an emergency. 3) Never replace something simply because it's old. Only replace things that no longer do what you need them to do. Don't be a sap and replace your measley 26" television with a new 50"+ one just because everyone else is. If yours breaks down or the colours are shot or something like that, then fine, buy what suits. But don't just start jonesing for things just because you think everyone else has them. 4) Always try to exercise rationality when making purchases. I own a freezer. It's helped me to make some pretty insane purchases at times, but they've saved me a tonne of money. J.M.Schneider's bacon at $.99 a pound? That's a once in a lifetime price, trust me... I grabbed 50 pounds of it and headed straight to the cashier. Same thing when 520g bars of cheese were $3.33. I hit up about 35 pounds of that stuff without batting an eye. Maybe the clerks give you the greasy eye (mine called the manager to confirm that they didn't have limits - they decided to put them on right after me.) But you can be secure in the knowledge that you will be able to ride on this deal until the next one comes around. I can't remember paying regular price for cheese in the past decade, that's for sure. And, sadly, I doubt if I'll be buying any bacon again after being spoiled for that price. When we bought our car, I looked at the big picture. I didn't see gasoline prices retreating for the long term, so I knew we wanted something that positively sipped fuel, and yet was still dependable and comfortable. We researched a fair bit, and then settled on a Toyota hatchback. 5) Recognize that money is only a means to an end, not an end in itself. Sure, one could probably eke out a few extra $$ here and there by totally gaming the system and doing balance transfers and rotating stocks and analysing every fiscal decision to death, but I feel that anyone who declares that their time is worth money, must be willing to admit that if they want more time, maybe they have to be willing to stop trading so much of it for money. Especially if you are going to be trading hours of time to save pennies. By following a few rules of simplifying, while not actually drastically removing yourself from the world economy, you can greatly decrease the time spent obsessing about your dollar net worth. I should probably also point out how difficult it is to properly embed pictures into blogger posts... I'm not sure why that is, but you'll have to live with whatever I cobble together on this post. Donna called for help, but before I could arrive, Kenny's obviously burbly stomach rejected whatever he had been sleeping on, and he threw up for only the second time in his life. All down Donna's front. Just like the first time he threw up too! That makes cleanup a snap for me, but I'm not sure if Donna thinks that it's as convenient. Kenny had been fighting a fever most of the weekend, but seemed recovered by last night. I'm not sure what disagreed with him this morning, but, aside from the whole weekend's fussiness and irritability, he was fine. Seeing as it was a holiday, Kenny and I got to have Mommy around the whole day again - that's a real treat for both of us! It also gave me the opportunity to really focus on getting some projects done that are otherwise somewhat difficult. Today I tried to clean up the garden a bit. Last fall and this spring, I turned over the area between our house and the garage of the neighbour next door. Then I planted two of the three sisters. That is to say, corn, and squash, and pumpkin... We still have beans leftover from last year that I canned up. As you can see, they're holding their own against the weeds! Kenny insisted on helping to clean up the lower, main garden area, by mowing in between all the raised beds. Trust me, although his mower looks like the only one that did the work, it really was a team effort. Me with my shears and reel mower, and Kenny providing moral support. The raspberry patch has recovered quite strongly from being moved a number of years ago, and is now beginning to actually make a nuisance of itself by spreading back towards my garden beds. A combination of mowing and cutting it back, as well as using clothes pegs to hold it against the fence seems to work satisfactorily to keep it civil. An entire bed of carrots promises to be a real pleasure in the coming weeks and months. By square-foot gardening, I haven't had to do much in the way of thinning of them, and they all seem to be thriving quite nicely. Tomatoes too are doing well this year. But as often is the case, regular peppers make me question if they are worth the effort. Hot peppers are a mixed bag at times. I sometimes get enough for the coming year with ease, and other times I only get a small handful. This year seems to be a small handful year, so I'll likely have to invest in a bottle of hot sauce to see me through. Oh well, it's a learning process. The strawberry patches at the base of the retaining wall look quite lush, and Kenny has delighted in picking them clean, but they've actually been rather meagre providers, either that, or the birds and animals are picking things prematurely. Three full beds of potatoes are doing really well, and I'm quite pleased with them. You can see that Kenny seemed to have recovered from his tough morning, and was ready to take on just about anything we could throw his way! Apple Cider - In four steps, and two ingredients. For those of you hooked on Pruno, you might want to take note, as this is far easier to make (assuming you AREN'T incarcerated), and much nicer for your pallette. In my ongoing efforts to trim costs, as well as learn new (read : old) skills, I decided that it was a good idea to brew my own alcohol. In university, I began by copying the methods of my father, who had dabbled (and still does), with brewing his own beer and wine. Not being a wine drinker, I stuck with beer. And oh what beer we brewed... Chocolate mint beer at Christmas, and then a series of "heavy metal" beers with theme names like Bronze, Chrome, Steel and the dark, weighty "Iron". Exploding bottles and entire fridges filled to the gills with old stubbies are also fond memories of that time. Anyway, beer is fun, but it does take a fair more effort than I wanted to expend. Boiling the wort, sterilizing hundreds of bottles, vapour locks, carbuoys, caps and cappers... It takes hours of time to really successfully obtain a few cases of beer. Technically, this is still probably a decent investment in time. With the price of a case of swill approaching $30.00, for many of us, that represents an equal number of hours working "for the man" - something I'd always readily trade away to do the work directly for myself. Brewing up apple cider is so easy, you'd be nuts NOT to try it after this. add about 1/4 teaspoon of the yeast to the bottle of apple juice. wait a week or two, until the bubbles which appear after a few days slow down or disappear. you are interested in the actual alcohol content of your cider, you need to use a hydrometer. Take a reading before you add your yeast, and then again when it is time to bottle your cider. Most hydrometers that I have seen already have the potential alcohol scale marked off, so you can just subtract the potential from the final, and the difference is your content. Mine has ranged from about 3.5 to 7, depending on how long I permit the fermentation to last. If you bottle while there are still visible bubbles in the juice, then you will likely get a more carbonated beverage that "pops" when you open it. If you wait until the bubbles are completely finished, the cider will be more flat, but also more potent. I use a hose to bottle, as you get less yeast and sediment in your finished product, but it's not harmful to drink. In fact, it sounds more like a miracle food! Serve nice and cold from your fridge, and enjoy the notion of getting a buzz from something that probably takes less effort than making a special trip to The Beer Store! 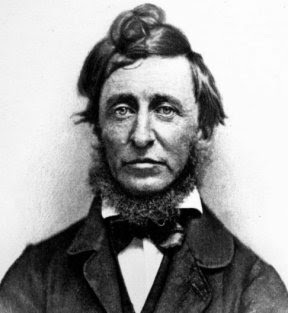 I don't think I need to tell you that Thoreau wasn't really a guy who had lots of luck with the ladies, but he definitely had some ideas that continue to speak to all of us, removed as we may be from his world and circumstances. Mine use to take up numerous 3" binders every year. I feel I've made huge progress in this respect by paring things down to two 1" binders, but it still takes up far too many hours to merely push these papers from one place to the next. Then I find myself reconciling two bank accounts and three credit cards! "Our life is frittered away by detail. An honest man has hardly need to count more than his ten fingers, or in extreme cases he may add his ten toes, and lump the rest. Simplicity, simplicity, simplicity! I say, let your affairs be as two or three, and not a hundred or a thousand; instead of a million count half a dozen..."
I never use to envy people who operated in the underground economy. I thought they were doing it to avoid taxes. Now I have a profound jealousy for the notion of returning to a strictly cash economy. Not to avoid your social responsibilities, which perhaps will be grist for another post another day, but to avoid trading hours of your life for details that don't offer enough value to justify your attention.